JUST HOW DOES THIS PRODUCT DEPLEAT THE MOUSE POPULATION? I HAVE BEEN USING THE BLUE DITRAC ALL WEATHER BLOCS AND THE MICE KEEP COMING...DOESN'T SEEM TO DIMINISH THE POPULATION. Blue Blox are probably Contrac Blox which is a "moderate toxicity" blox containing Brodificoum. It is the most popular of all the rodents baits on the market, and heavily used in the pest industry. Generally, Contrac is a 2-3 feed product meaning that the rodents have to consume usually 1 oz per lb of body weight to kill them. Ditrac contains Diphacinone is a light yellow in color, and is a multiple feed rodent bait. Basically, the rodents have to eat it "multiple times", generally consuming an amount that is equal to their body weight before it kills them. Diphacinone is safer to use around pets, animals, children and other non-targets. It is generally available in smaller quantities due to the EPA's Rodenticide laws restricting the sale of certain rodenticides to the public in small quantites. Ditrac is on the "less toxic" end of Bell Laboratories line of rodent baits. It is generally used for retail sale and for "maintenance applications where rodents are not a big issue, but you want to keep the population under control. 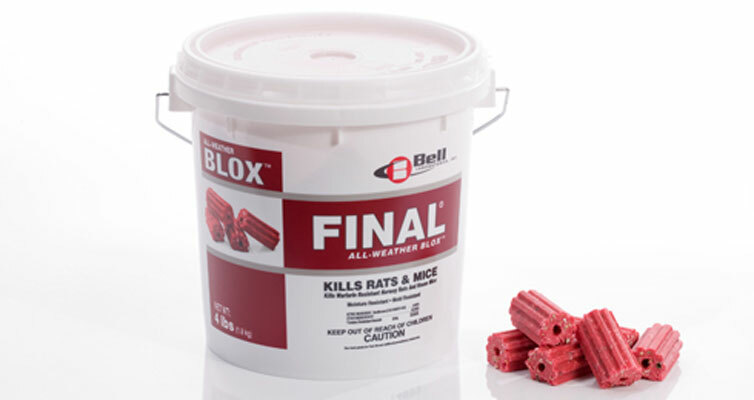 Final Blox is on the "most toxic" end of Bell Labs line of rodent baits. It contains Brodificoum, which is a highly toxic poison. Final Blox are designed to quickly eliminate rodent infestations, for "clean out" applications and is considered more of a professional use product due to it's being so toxic. Generally, it is considered a "single feed" rodent bait, meaning that the rodents only have to eat it 1 time before it kills them. This type of bait is much more likely to cause harm to non-targets and is therefore not sold in small quantities, usually only 18 lbs or more.